Your alarm sounds at 6:00 am. You roll out of bed and hop into the shower. You proceed to run to the coffee maker to start the first pot of the day, clad in your robe and slippers. As fast as you can, you throw a load of laundry into the machine and sort the pile on the floor, in hopes you will be washing everything later in the day. You return to the kitchen and have just poured your cup of coffee when you hear the baby squawking in his crib. Still dressed in only your robe and slippers you head upstairs, open the door to the nursery, and there he is smiling and cooing. Your little man is bright eyed and hungry at 6:45am. After dressing and feeding the baby, you place him in his bouncy seat for a few moments so you can throw on some clothes, preferably some comfy sweats that can stand up to the spills and spit ups of the day ahead. After switching the laundry and forty minutes of play with the baby, he is ready for his first nap. You race around the house while he naps, attacking e-mails, more laundry, phone calls, and oh yes, breakfast for yourself! Two hours pass faster than the blink of an eye and the little man is ready to eat again. After eating, he simply refuses to be placed on the floor, chair, or swing so he becomes an attachment to your hip as you finish writing the grocery list. After bundling up both yourself and the baby, you head out to the grocery store for a lightning fast shopping excursion before his next nap. Upon carrying in the groceries while the baby is screaming, one of the bags breaks and sends cans rolling across the kitchen floor. Before picking them up, you take the baby upstairs and place him in his crib for another nap. As you are picking up the cans strewed across the floor, you decide to pop one of them open and heat it on the stove for lunch. After the groceries are put away and you have gulped down your lunch, it is time to throw together dinner. You chop up all the ingredients, throw them in the crock-pot, and turn it to high. After glancing at an afternoon talk show, your baby boy announces he is awake and ready to eat again. He coos and squirms happily on the floor after eating, while you lay beside him trying to keep your eyes open. You suddenly remember the laundry in the washing machine and pray it has not reached the “musty” stage from sitting in the machine for hours. The laundry in the dryer is of course a bit wrinkled, but you fold it anyway. Your baby watches with great interest as you fold and put away clothes. Luckily tonight, the baby sits nicely in his bouncy chair at the dinner table while you and your partner enjoy a nice meal and a little adult conversation. After placing the dinner dishes in the dishwasher you enjoy a little family time with the baby and your partner. Not long after you have all played together, your baby starts to show signs of being sleepy. You go upstairs to run his bath, gather his pajamas and then run downstairs to grab a bottle. As he splashes in the warm water you can’t help but feel an incredible amount of love for this baby. Yes, he may have added to the chaos in your daily life, but you would not change a thing. After a nice little massage and a bottle, the baby is dozing in your arms. You lay him down in his crib and tip-toe out of his room. You breathe a sigh of relief as you close the door. Now what? There are plenty of chores around the house to do, but you are exhausted. You decide instead to run yourself a nice hot bath. Slipping into the water you feel tension begin to melt away. After fifteen minutes of soaking in silence you force yourself out of the bathtub and into your pajamas. Your partner is waiting on the couch to catch up on your favorite sitcom and as you curl up, you feel yourself drifting off to sleep…. Whew, I am tired just writing that scenario but, for many of you with infants, this is a typical day! After so much running around and going non-stop, notice that in the story above, both baby and mom enjoyed a nice bath to help them unwind and relax before bed. Do you and your baby do the same? When baby begins showing sleepy signs (yawning, rubbing eyes, gazing into the distance, etc. ), begin bath time. If you wait too long, you will have an overtired baby on your hands… and we all know how difficult getting an overtired baby to sleep is! While running the bath water, gather all the supplies you will need during and immediately after his bath. These supplies include pajamas, a diaper, 2 fluffy towels (one for baby, one to lay on the floor or changing table during baby’s massage), baby wash, a washcloth, baby lotion, and your baby’s favorite swaddling blanket. The way you bathe your baby is really up to you and however you feel most comfortable. I personally have a technique I like to use with babies who are still small enough to be held with one arm and do not squirm too much. I undress baby down to his diaper, wrap him in a towel and hold him in my right arm. Then, leaning slightly over the bathtub, I wet only his head and wash his hair. I then wash his face and neck with the washcloth. After washing baby’s hair, face, and neck, I dry him and remove his diaper. I then place baby in the bathtub, supporting his head and neck with my left hand and washing his body with soap and a washcloth with my right. By washing baby’s hair, face, and neck first you shorten the time he is completely naked and lessen the chance of him becoming chilly with his wet head sticking out of the water. After baby has been washed, pull him out of the bathtub and wrap him in the towel. Find a place where you are comfortable giving him a massage, I prefer the bathroom floor on top of a fluffy towel since it is already warm and humid from his bath. You can also massage baby on your bed, on the changing table, etc. Refer back to the blog “Try This: Massage” from earlier this month for detailed instructions on how to massage your infant. 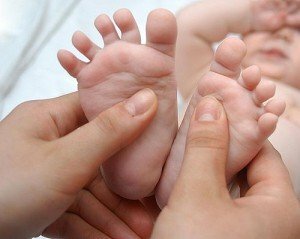 After your baby’s massage, place him in his pajamas, wrap him in his favorite swaddling blanket, and feed him his last bottle of the night in his dimly lit bedroom. Odds are, he will feel heavy and relaxed in your arms before he even begins eating his bottle. If your baby still requires burping during feedings, make sure to burp him when he has one ounce left in his bottle. Continue feeding him until the bottle is empty, then gently lay him in his crib and allow him to drift into sleep in his own. Now that your baby is sleeping soundly it’s your turn! Throughout your day, you are running around and your mind is constantly working and thinking of tasks you need to complete. You push yourself to accomplish as much as possible during the day. After your baby is asleep, allow yourself time to relax. Any chores that may not have been completed can be left for tomorrow. For new parents one of the number one rules is, when baby sleeps, you sleep! 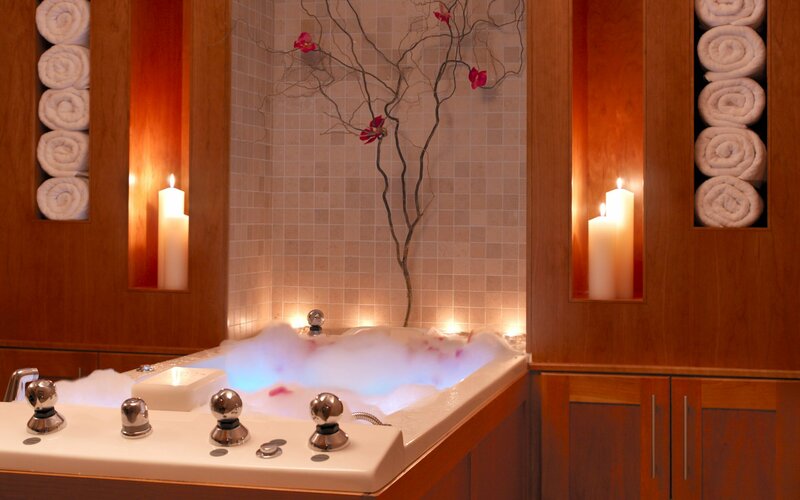 Help yourself unwind and allow your tensions to melt away by soaking in a hot bath or taking a steamy shower. Trust me, you will feel much better going to sleep knowing you have washed off the spit up, formula, baby food, boogers, and whatever else may have ended up on you throughout the day. After your shower or bath, pamper yourself with some lotion and put on your favorite pajamas. Take some time to talk with your partner and connect at the end of the day. When you crawl into your cozy bed, close your eyes and allow your mind to focus on your breathing rather than the laundry, the dishes, or the e-mails. As you fall into sleep, develop the sense that you are falling into a rich and wonderful inner world, the world of sleep and your dreams.